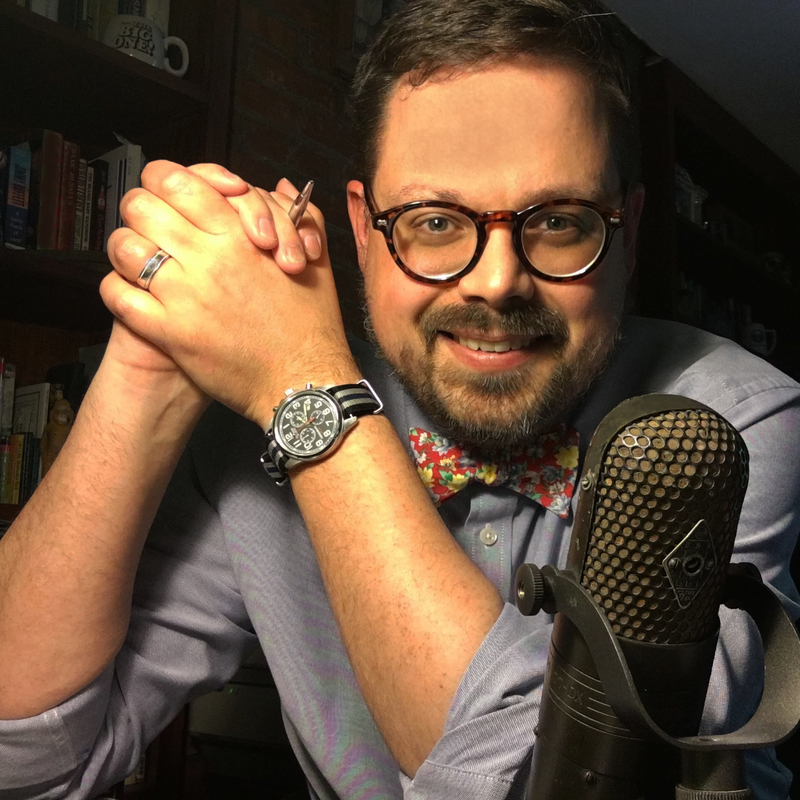 Having recently spent an afternoon going through family history with my mom’s older brother, my uncle Jim Coyle, there were plenty of wonderful, flashy items. 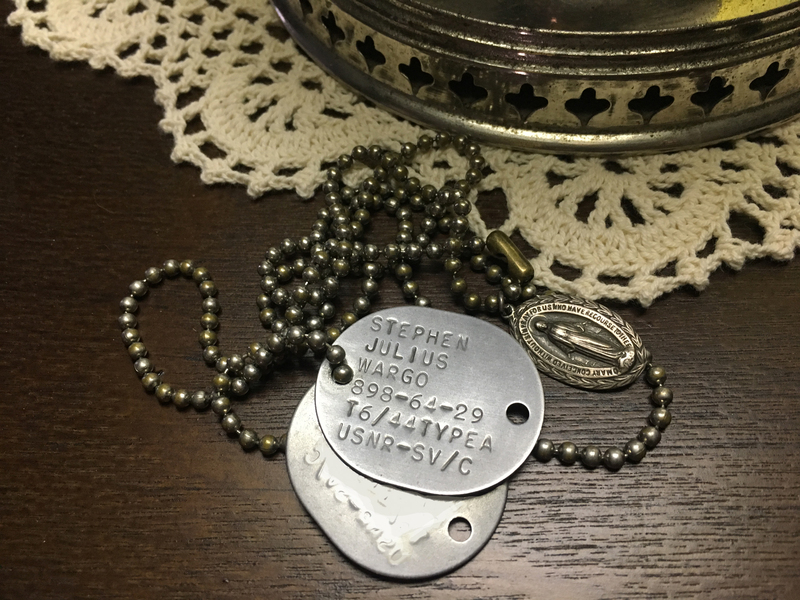 The dog tags (and attached Miraculous medal) Great-Grandpa Wargo wore as an Aviation Metalsmith 3rd Class in the Pacific during World War II. 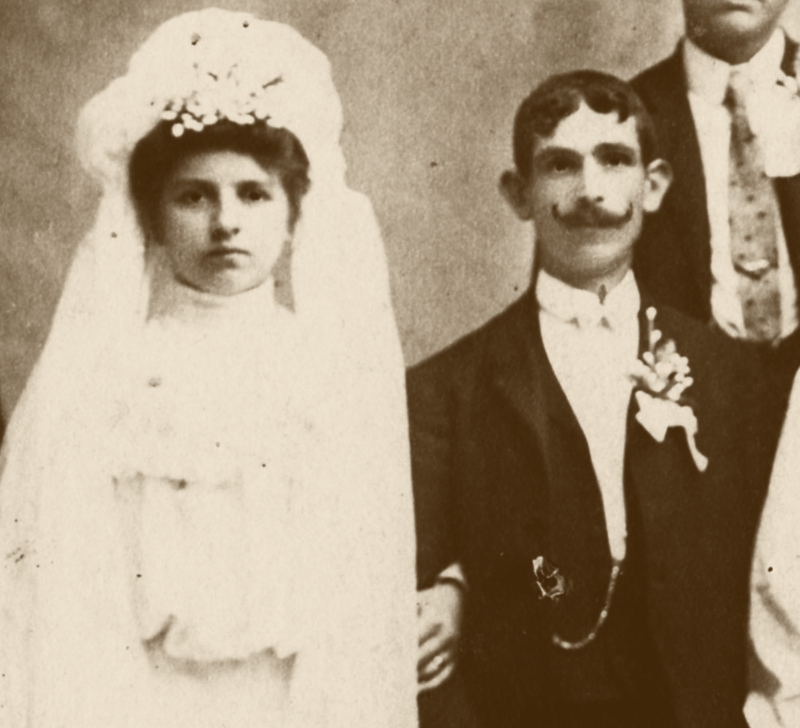 Photos of Great-Grandpa Wargo’s parents’ wedding in 1906. 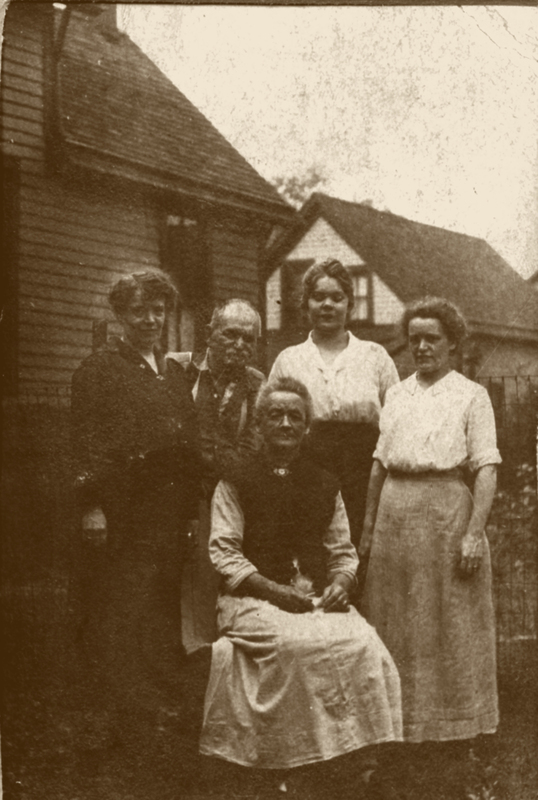 Photos of Great-Grandma Wargo’s grandparents, John Prentiss and Mary Greiner, outside their East Side Buffalo home in the 1910s. The spot is now covered by the Buffalo/Niagara Medical campus. 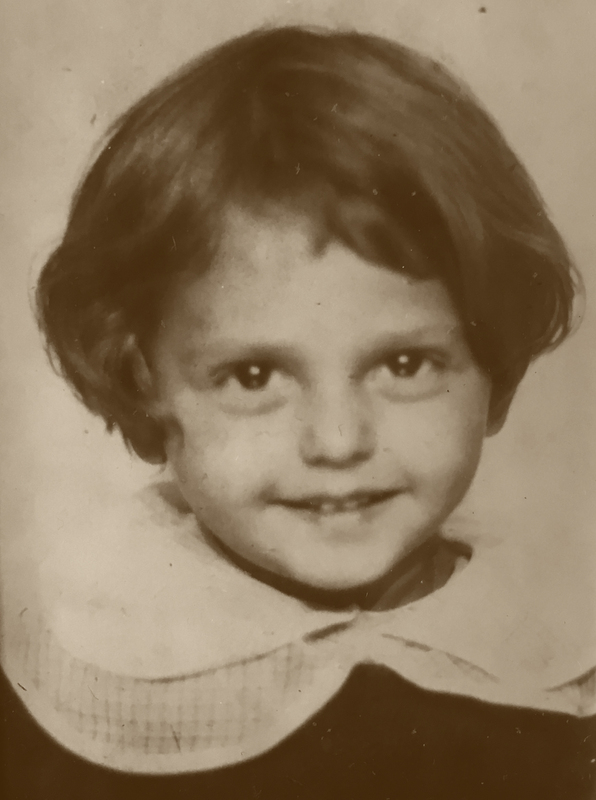 What looks to be a Kindergarten photo of my grandmother, June Wargo Coyle. It was instantly one of my favorite photos of her. 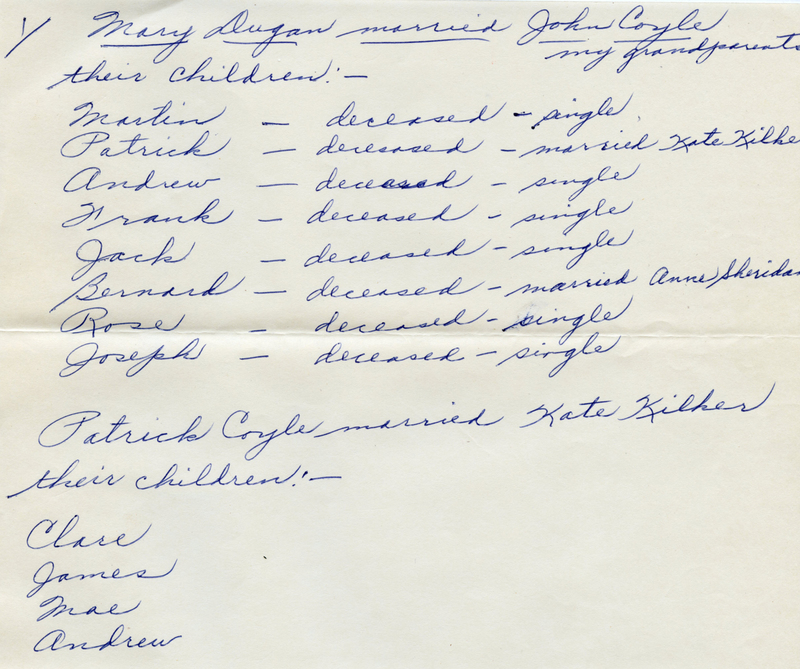 Not quite as flashy, a six-page letter, written in long hand, by an older Coyle cousin with information meant for young genealogist uncle Jim Coyle in 1971. Mary Coyle was my great grandfather Coyle’s first cousin. She was born in 1906, and spent the early part of her life living among our ancestors and extended family in Pennsylvania coal country. It was another Coyle cousin– Ceil Gallagher– who reached out to Mary on Jim’s behalf. Ceil lived in the Marine Drive Apartments, and the first couple of pages of Mary’s letter is the good, old fashioned kind of long hand letter that people don’t write anymore– complete with complaints about troubles with legs and invitations to come visit. “We have plenty of room,” writes Mary to Ceil. Then there are several generations of the Coyle family tree, almost certainly (and perfectly) rendered from Mary’s memory… people who would have been Grandpa Coyle’s great-aunts and great uncles and their children and grandchildren. My favorite part of the letter (and probably ol’Mary’s favorite part to write) is the last page. 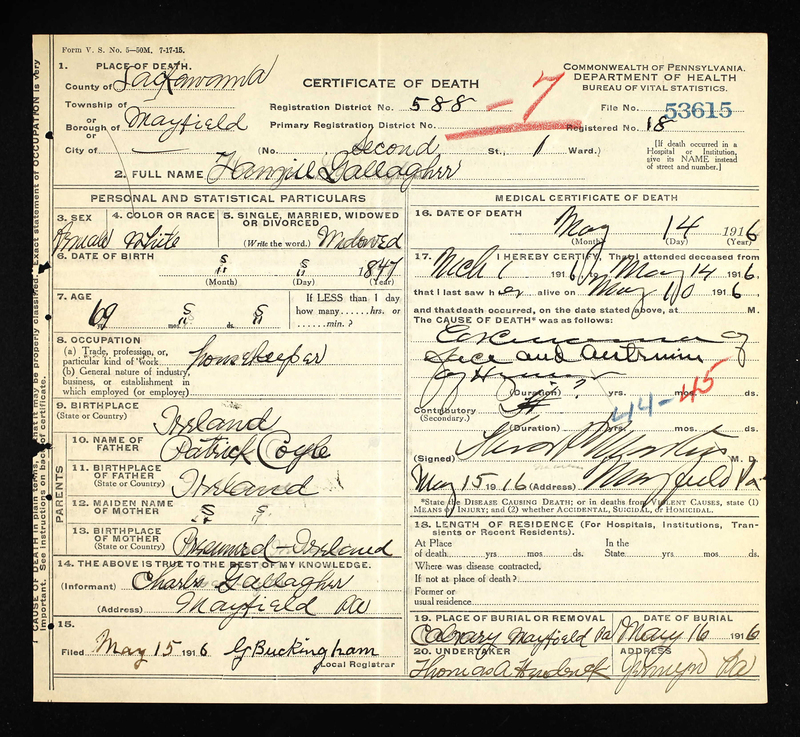 John Coyle’s death certificate. He was letter writer Mary Coyle’s grandfather, my third-great grandfather. John Coyle (c.1849-1908) came to Pennsylvania from Ireland around 1861 and married Mary Dugan around 1865. Those immigration and marriage years are based soley upon data in the 1900 census.) Up until Mary’s letter, the information on census reports and this death certificate are all that I’ve known about John Coyle’s history. He came to the US at a point when records weren’t kept as well as they would be in years to come. The fact that John Coyle is a common name doesn’t help. We can’t be sure when or through where he immigrated, or where in Ireland he came from. But once he was here, the John Coyle family lived in and around the coal towns of Carbondale, Mayfield, and Jermyn in Lackawanna County. According to the 1880 census, their son Andrew was born in New Jersey– they clearly moved a lot, to where ever the mining jobs were. There were seven boys in the family, and those boys worked jobs in the mines just like their father– things like breaking up larger chunks of coal and leading the donkeys pulling the carts of coal. They eventually moved about an hour’s drive south to Beaver Meadows in Carbon County. Some of the family also eventually wound up in the larger cities of Scranton and Wilkes-Barre, which are in between these clusters of towns. 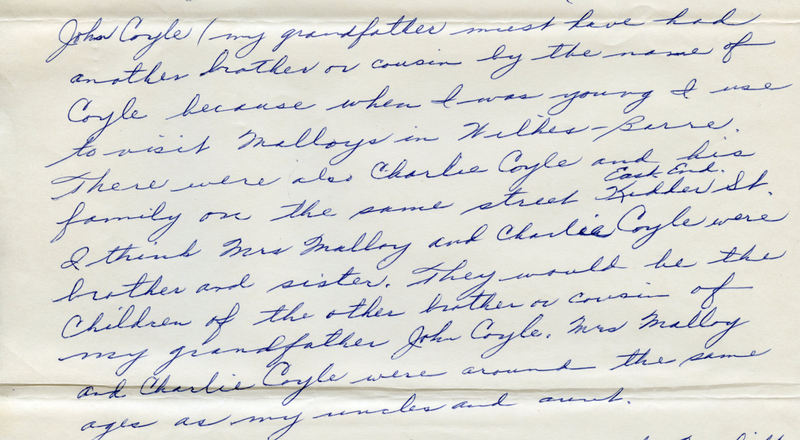 Mary Coyle writes what she knows about her grandfather’s sister. In what was new information to me, Mary writes that John Coyle had a sister– who was known as Biddy, Fanny, or Frances. She married a man named Gallagher and had two kids. Margaret married Sherman Tompkins and Charles married Jennie Keating. 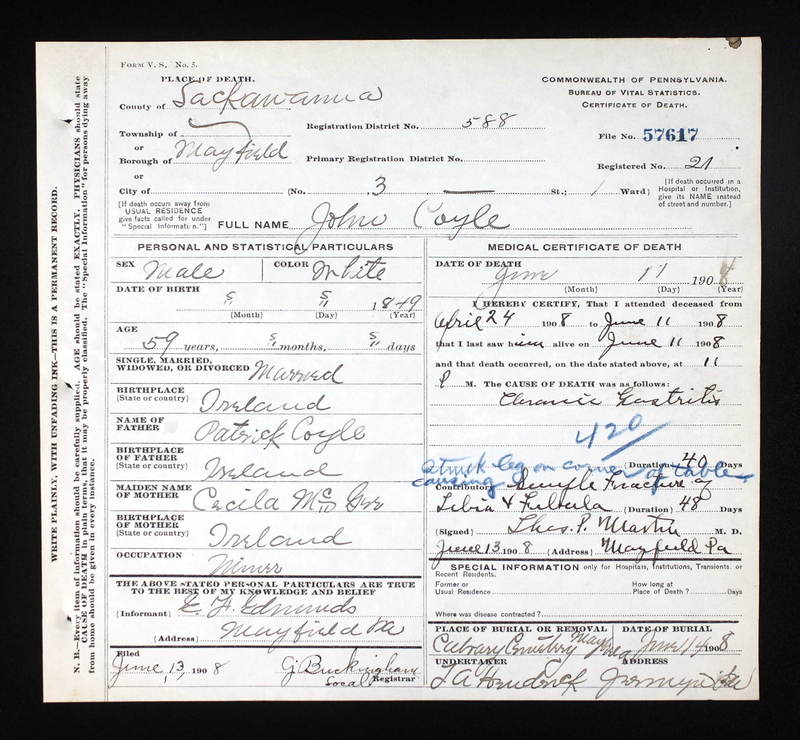 Fanny Coyle-Gallagher’s death certificate gives her father’s name as Patrick Coyle– a very common name, but also the name given as John Coyle’s father, lending creedence to Mary’s story that they are brother and sister. Searches on ancestry.com show many of Fanny/Frances Coyle-Gallagher’s descendants have traced their lineage back to her, but none have connected Fanny and John as brother and sister. Like John, Fanny came to the US from Ireland. But she came a few years later– and already married, which makes her easier to trace. Fanny Coyle was married to John Gallagher in Gweedore, County Donegal, on 22 Feb 1870– there were a few people who linked that information from a list at donegalgenealogy.com. The names look like other names that pop up with the Coyles– Gallaghers, McGees, Duggan, etc, which is another good sign that it’s the right place to look. 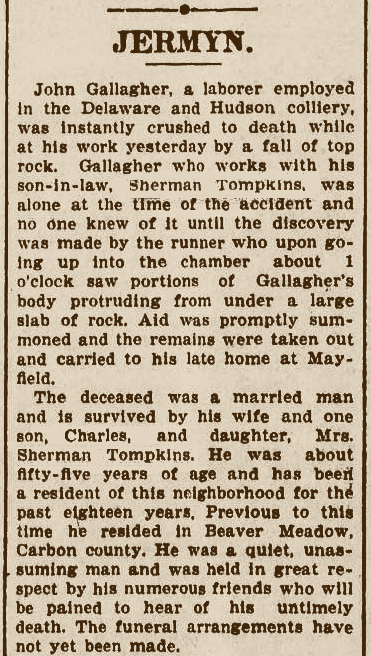 John Gallagher was tragically killed in 1905. The story of his death was carried in the newspaper. His early death would also explain why Mary Coyle didn’t know his name. There are a few trees which mention Fanny Coyle-Gallagher, but appear to trace back the wrong Patrick Coyle as her father. Based on the dates alone, they have the wrong guy. One ancestry.com member– Edward O’Donnell Neary– seems to have some good information from somewhere, perhaps from a family bible or other source that has been handed down. His tree has Fanny’s father as John Patrick Coyle, born 21 March 1824 in County Donegal, Ireland and died March 1894 in Dunfanaghy, County Donegal. The good news there, is he also has Fanny’s mother as Cecila McGee– the name that matches John Coyle’s Pennsylvania death certificate. I’m reaching out to him to see where he got this information from, and to share the information that I’ve been working with. Mary goes onto explain that her grandfather John must have had another brother or cousin, because she remembers visiting Mrs. Malloy and Charlie Coyle who both lived on Kidder Street in Wilkes-Barre. She’s right once again. Charles J. Coyle and Isabelle “Bella” Coyle-Malloy were two of the six children of Andrew Coyle and Mary O’Donnell-Coyle. The family of Andrew Coyle, 1880 Census. Beaver Meadow Mines, PA.
At this point, given the facts presented in Mary’s letter, it’s clear this group of Coyles is related. What isn’t clear, is how they are related. To figure that out, we’ll have to learn more about Andrew, like his death date– with the hopes of finding his death certificate, which should give his parents’ names. Mary visited Mrs. Turnbaugh(?) in Beaver Meadows, whom she believed to be her fathers’ aunt. This is the only lead that doesn’t bear any immediate fruit. The only Turnbaugh woman of the proper age in Carbon County was born in England. This needs further research. She also remembers visiting Celia O’Donnell and the McGees in McAdoo, PA. McGee is John Coyle’s mother’s maiden name, and there are several McGee/Coyle marriages of people in McAdoo, but no solid connections without further investigation. One final note on ancient Coyle history came in the beginning part of the letter. For all the she remembered about John Coyle’s relatives, she didn’t know anything about his wife– my great-great Grandmother– Mary Duggan Coyle. Because Mary Coyle sat down and wrote a letter 50 years ago, hundreds of her cousins all over the world are closer to understanding a little more about where we’ve come from. And that is pretty great.